We Get It Clean, Quickly! If you would like to give your property a thorough beautifying cleaning, you can never go wrong with pressure washing. But for exceptional results, you would be better off leaving the job to the pros. We have a team of technicians with the full package: industry-grade equipment, extensive experience, and a natural love for the job. NICK’S Window Cleaning is your trusted cleaning partner. 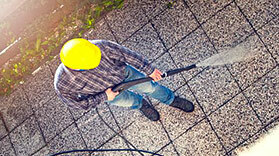 Our commitment is to delivering pressure washing services Mississauga property owners can count on. We show up to every single job with reliable equipment and a great work ethic to match! Do not make the regrettable mistake of attempting to power wash your property by yourself. The equipment can be dangerous and the right cleaning techniques only come after proper training. People have injured themselves and damaged their homes after mishandling pressure washing equipment. DIY pressure washing often leads to unsatisfactory results. Each material on your property is unique and as such needs a unique approach. But that is not something you can figure out over the weekend. Instead of gambling with your property, you can get far better results just by giving the pros a call. We know you value your home, and that is why we promise to bring our A game to the job. 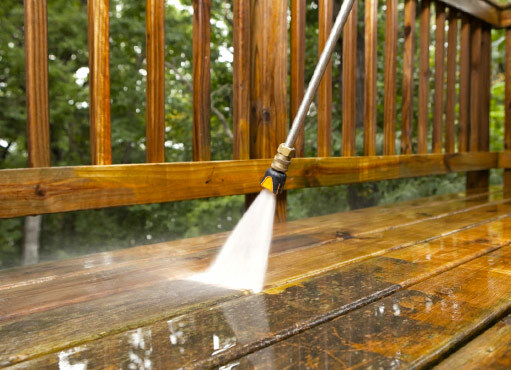 We will get rid of the grime on your driveway, moss on your roof, and those nasty streaks and stains on your deck. By the time we are through, your home will be the envy of your entire block. For businesses a clean environment can go a long way in giving you a respected cooperate image. Our professional cleaners have experience tacking different commercial property. Every cleaning job is different. We understand that and that is why will first determine what exactly your property needs, and then go the extra mile to make sure that the job is done swiftly and thoroughly. If you are in the GTA, there is no reason why your home should not be sparkling right now. For more than ten years, we have been a power washing company Mississauga residents have been calling for their cleaning. Have a dirt problem? We have a clean solution. We will be fast. We will be thorough. We are dependable! Some people argue that pressure washing is a task they can perform by themselves. However, the job requires special knowledge and is best left to professionals. Here are some reasons why DIY power washing is not the best idea if you truly value your property. You don’t have access to the best equipment: There are lots of brands of pressure washing equipment on the market. As with anything, some of them are useless and the average homeowner cannot tell the good and the bad apart. Instead of risking your money on a power washer that might turn out to be inefficient and not durable, your money can be put to better use by hiring pros. Since they are in the industry, they know all the latest, most effective equipment in their field. You risk damaging your property: Power washing equipment is no joke when left in the hands of untrained handlers – the equipment can be destructive. It’s easy to end up with damaged surfaces with the wrong pressure settings. An experienced technicians with years in the industry can give you a safe power wash without putting your property at risk. Besides knowing the handling techniques that will make sure the cleaning is done without harming your property, professional power cleaning services come bonded and insured. You can rest assured that at the end of the day, your property will get a thorough cleaning with peace of mind on your part. Avoid injury: There is no shortage of horror stories of people that ended up suffering serious injuries after mishandling pressure washing equipment. The problem is that none- of these people suspected any danger. They all thought pressure washing equipment was well up their alley until it was too late. Cleaning companies are equipped with the handling know-how to make sure that they and everyone around is safe during the cleaning process. Save yourself time: Instead of spending your time trying to hire or buy the right pressure washing equipment, and more time trying to figure out how to safely operate it, why not just leave the whole business in the hands of professionals? The problem is that there is no guarantee that you will do a thorough cleanse even after spending so much time attempting to do the job yourself. A simple call to the professionals might save you a lot of time, energy, money, and headache. Invite them in!